BEIJING - A massive support package that includes preferential tax and resource policies will help the Xinjiang Uygur autonomous region catch up with the average national per capita GDP in five years. The central government unveiled the ambitious goal on Thursday to boost development and maintain stability in the region, which is of "particular and strategic significance". "Marked improvement" must be achieved in infrastructure, development capacity, ethnic unity and social stability within five years, President Hu Jintao told a conference. Xinjiang should fulfill the goal of building a moderately prosperous society in all aspects by 2020 through coordinated regional development, Hu said, adding the region should improve people's living standards and build an eco-friendly environment, as well as ensure ethnic unity, social stability and security. The package was released after a three-day working conference in Beijing that began on Monday. This is the first time the central government has held a top-level development conference for the region since the founding of New China in 1949. Hu said Xinjiang has a "particularly significant strategic position" in the country. He vowed to spend more to improve the region's public services by implementing major projects to provide local people with a "modern and civilized" living environment. Separatist activities exist, Hu said, adding that maintaining social stability and achieving fast-track development are twin priorities. The July 5 riots in Urumqi, capital of the region, left 197 dead and at least 1,700 injured. More favorable policies are necessary to boost economic and social development in the region, said Premier Wen Jiabao, who also attended the meeting. Therefore, the central government has decided to start pilot reforms on resource tax in Xinjiang, in which the tax will be levied based on prices instead of quantity. The change is expected to significantly increase tax revenue for the regional government. Wen also said the policy on natural gas will be adjusted so that the local government will have more use of the resource. Commercial and foreign banks are encouraged to open branches, and financial institutions with branches are encouraged to open more in its remote areas. Enterprises in poor areas will have corporate income tax waived or cut. Funds allocated by the central government will continue to increase. More land will be released for construction and market access will be made easier for some industries. Before the latest package was announced, the central government nominated 19 relatively-prosperous provinces and municipalities to partner and provide assistance to designated areas in the region. All these policies show the resolve of the central government and the Central Committee of the Communist Party of China to speed up Xinjiang's development, Wen said. "The region still lags behind other provinces and faces challenges in capital, technology, skills, management and other areas," Ashar Turson, president of Xinjiang University of Finance and Economics, told China Daily on Thursday night. "So achieving fast growth without assistance from the central government is almost impossible," he said. He welcomed government's decision on the pilot reform of resource tax, which will help increase the regional government's revenues. "The change of policy could generate 8 to 10 billion yuan ($1.17-1.46 billion) extra to Xinjiang's fiscal income every year, almost a quarter of its total," Ashar said. 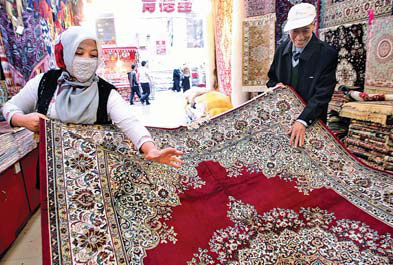 The fiscal income in Xinjiang last year was about 38.8 billion yuan. Xinjiang residents have been eagerly looking forward to the details of the support package since March, when news of the working conference was announced, he said. "Economic development and improving people's livelihood are key to maintaining the region's long-term stability, because people are unlikely to be manipulated by terrorists or separatists when they are happy with their lives," Ashar said.